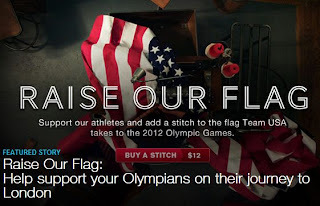 I just added a stitch to help Raise Our Flag at the Summer Olympics. Proceeds go to the support the USA Olympians but even if you don't want to donate a stitch you should check out the website to see a flash video of the flags being made. Pretty dang cool!! Below are my stitch numbers...I bought two! Anyway, I thought it was a great way to participate in the Olympics and to celebrate the 4th of July - Independence Day! So THAT'S where you have beeen! ;) I did not even remember the Olympics were coming up until a patient of mine mentioned it...so there are trials going on? Where have I been? Awesome that you are participating this way, it's pretty exciting to get to do that. Wonderful way to participate and help the athletes , much check this website. Enjoy the games it is nice to see you post. Great that you added "Stitch" to "Raise the Flag"...thought one evening when watching the 'trials' I would do that, but didn't do so yet...such a good program to support. I enjoy watching the gymnastics too!